Jack Cheng is the author of See You in the Cosmos, a new novel for kids. He also has written the novel These Days. 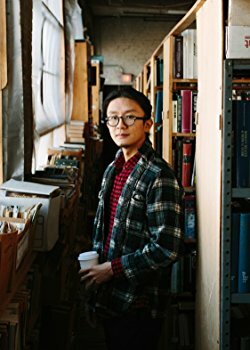 He was born in Shanghai and grew up in Michigan, and now lives in Detroit. Q: How did you come up with the idea for See You in the Cosmos, and for your main character, Alex? A: I was home at my parents’ for Thanksgiving and noticed a copy of Carl Sagan’s book Pale Blue Dot on my brother’s bookshelf. When I picked it up off the shelf, I remembered this episode of Radiolab I’d listened to years ago, in which Sagan’s widow Ann Druyan talked about how they fell in love as they worked to gather sounds for the Voyager Golden Record. I guess those things were kicking around in my head when I went to bed that night, because when I woke up I had an idea for a story about a boy and his dog trying to launch his iPod into space. I was also in between drafts of another novel at the time, so I pretty much started working on it right away. Q: The book is told in the form of recordings made by Alex. Why did you choose that format? A: It was one of those things that seemed natural from the beginning—I already had this iPod, so why not use it to tell the story? Thinking back on it now, the format was probably also influenced by the radio show mentioned above. When I’m writing I generally try not to invent anything I don’t have to. I try to make use of what’s already in the story to solve the story’s questions. In this case, the iPod seemed like a neat solution to the question of narrative format. A: I might have an idea of the general direction a book is going, but otherwise I’m very much in it along with the characters. They have things they want—Alex for instance, wants to launch his rocket—and that suggests that we’re building to some kind of launch or attempted launch. But it might not be the end of the story. It might be that in the process of trying to get what he wants, Alex’s wants change, or he gets what he wants but not in the way he or I had first imagined; he comes to find what he really needs. An analogy I use sometimes, which I believe I first came across in Peter Turchi’s book, Maps of the Imagination: The Writer as Cartographer, is that writing is like mapmaking. The first time through—the first couple of drafts—you’re exploring this unfamiliar terrain. Only after you’ve done that can you draw up a map—and act as a guide—for the reader. Q: Are you, like your character, a big fan of Carl Sagan’s work? A: I wasn’t quite as obsessed as Alex is—and had a much broader range of interests as a kid—but through the course of writing the book and immersing myself in Sagan’s work, I definitely became a huge fan. I think what impresses me most about Sagan is his sense of awe and wonder for the mysterious and unknown—for the processes of questioning and discovering, and how those processes connect us to a basic humanity. A: Another contemporary middle grade novel, this one set in Michigan. 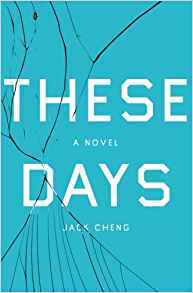 It’ll be much more directly about being an Asian American kid growing up, as I did, in metro Detroit. 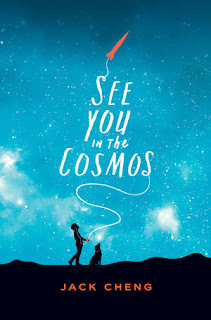 A: I produced a series of podcasts about the making of See You in the Cosmos, where I interviewed some of the people involved in turning the manuscript into a published book. If your readers are aspiring authors or just curious about the publishing side of things, I think they might find it interesting!